Gigs. More often than not, you’re standing in a room surrounded by a crowd of sweaty strangers. You will be jabbed by pointing elbows as fellow concert-goers jostle for prime position. Beer will unquestionably be spilt on you. By the time you leave, your toes will be bruised and your ears will be ringing. You’ll likely be desperate for a wee, having sensibly decided to steer clear of the toilets, which are, as a general rule, grim on an apocalyptic level . If you worked up the courage to brave the bar queue, you’ll also probably be destitute by the time the band exits the stage – in arena venues, five pound pints are the norm. Despite all of these apparent drawbacks and obstacles, in the case of live music, I firmly believe that the rewards outweigh the trauma. I argue that every gig I have ever been to has had its own rewards. They’ve certainly all been, at the very least, an experience. Even the ones that weren’t particularly good. There is something special about hearing music live. For me, there is no moment more electric than hearing the sound of the crowd screaming as one in anticipation when the lights dim. There’s no feeling better than sensing an excitement so palpable you can almost touch it when the band are about to head onstage. Hearing the opening notes to your favourite song at a live gig can make your heart soar. An amazing encore can leave you reeling and buzzing with excitement for hours after the show has ended. I got all of these amazing (and legal) highs when I was lucky enough to attend an Iron Maiden concert the night before writing this post. It was phenomenal. 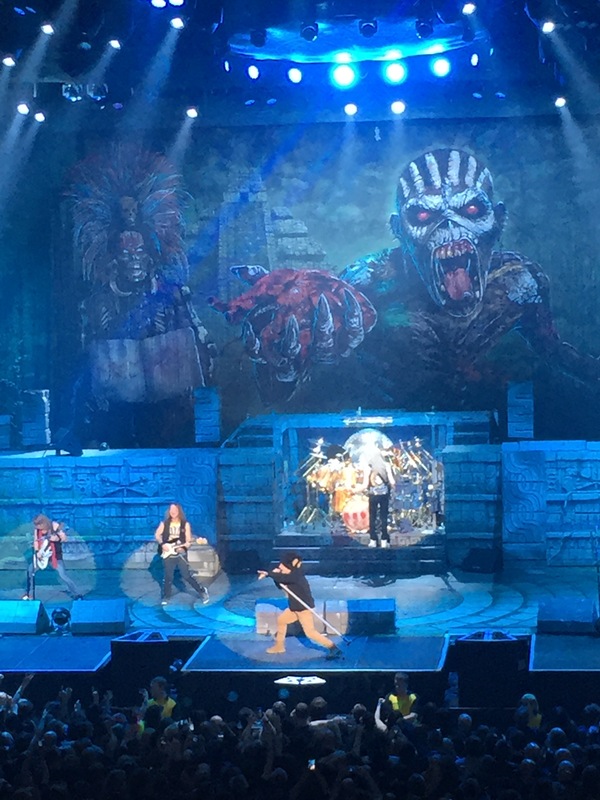 Even seated, the energy radiating from a bunch of strangers congregated as one body to rock the f**ck out – or at least, gathered companionably to sit comfortably in an allocated seat, enjoy the music, politely head-bang and bask in Iron Maiden’s glory – was palpable. There were new fans and fans that had clearly worshipped the band from their genesis (not to mix band metaphors here – Phil Collins and Bruce Dickinson are pretty contrasting characters). I saw eight year olds obviously only recently Maiden-mad and eighty year old rock veterans. 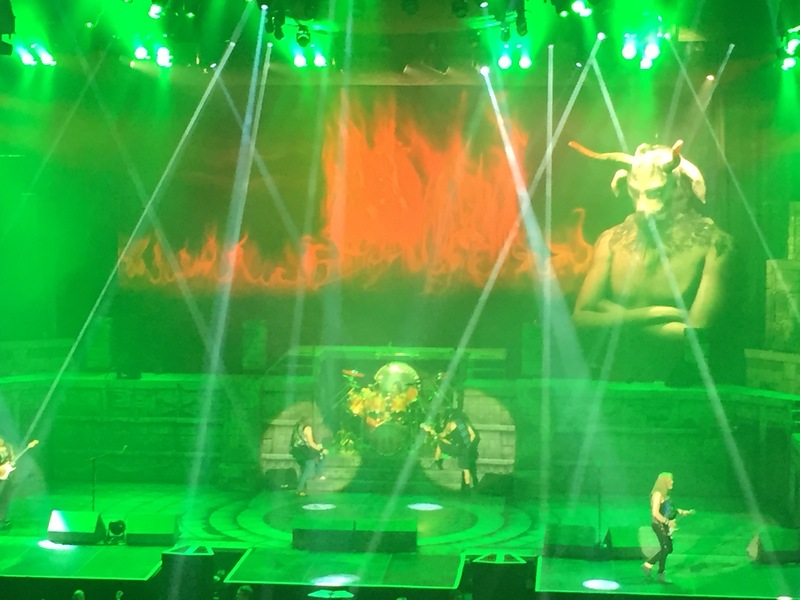 The eighty year old a few seats along from me went harder than I did; I have never heard ‘The Number of The Beast’ screamed with quite so much gusto. There were heavily tatted, burly-biker looking guys. There were pristine middle aged women with designer handbags, French Manicures and stylish-but-sensible Kitten heels. Gigs are a shared communion, a mixed bag of assorted characters. As lead-singer Dickinson himself pointed out, there were clearly attendees present that had loved Iron Maiden when they dominated the Heavy Metal scene in the early 1980s, and those whom (myself included, much to my chagrin – I feel in my heart that I belong to the decade of the synthesizer), weren’t even twinkles in our mother’s eyes in the 1980s. The best gigs are a unifying force, bringing together those of all colours, creeds, genders and ages. All I had in common with the vast majority of the strangers in the crowd was a shared appreciation for the music. For the length of the set-list at least, that mutual respect for the show we were being given was more than enough. 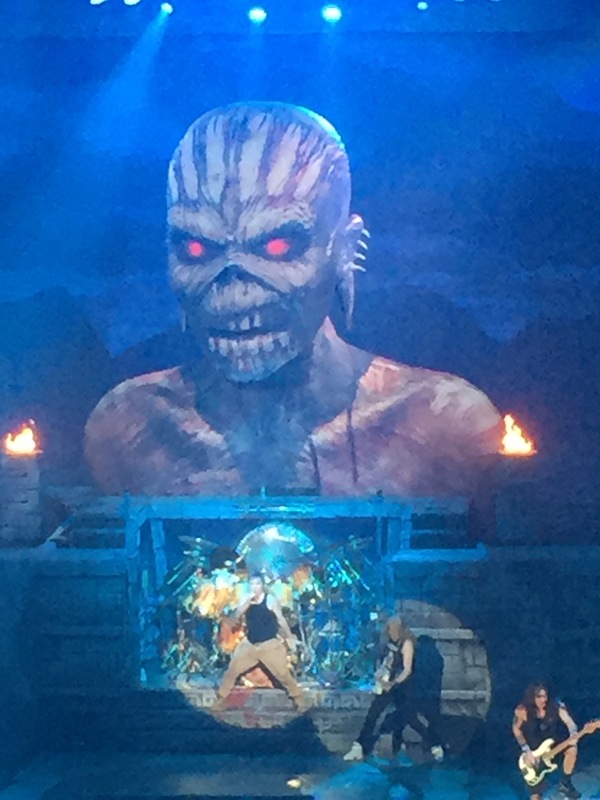 Ed The Head shows his beautiful face at Iron Maiden. Whether they’re full-blown rock gods or just-started small-timers, seeing a band/musician live makes you feel ten times more connected to them than you did previously. If you’ve seen an artist live, even if you weren’t hugely keen on them prior to this real-time encounter, after being in the same venue as them for more than a two-song set-list you’re likely to feel at least some kind of affinity with them. This artist-fan rapport can range from anything to a full-blown adoration to a grudging level of unwilling affection and respect. Silly and obvious as it sounds, being in the same room as a musical artist forces you to recognise that they are actually, y’know, real. They aren’t a disembodied voice emanating from your headphones. They’re a living, breathing, certified human-being, and if they’re worth their mike as a musician, they should be as excited to play for you as you are to listen to them. They’re just like us, except they probably have hundreds to thousands of screaming fans, possess a disarming level musical talent, and are likely to have a f**ck ton more money than you or I do. Over the years, I’ve seen concerts given by mega-famous, pop-princess girl bands (oh yes, I witnessed first-hand the Girls Aloud glory days). I’ve watched Rock Stars shred their electric guitars. I’ve belted out indie anthems from Brit-Pop heroes. I’ve head-bopped to rappers, likely looking incredibly uncool in the process. I’ve indie-shuffled awkwardly in bar room basements to niche, unsigned alt-rock four pieces. I’ve swayed to and sung along with folksy singer-songwriters, I’ve danced at festivals to that one-song-we-all-know delivered by one-hit wonders that peaked in the early 2000s. One of my all-time best gig experiences was tipsily stumbling into a tent and hearing the fantastic Gypsy Punk band ‘Gogol Bordello.’ I’d never heard of this group before, but, thanks to the efforts of the marvellously bonkers front-man Eugene Hütz, who generously persisted in chucking red wine into the audience whilst leaping about like an over-excited puppy, I’ve never quite forgotten them since. I’ve stood and watched the musical output of friends-of-friends with dubious talent but bags of charisma and an infectious enthusiasm. I’ve clapped, cheered, and, on the whole, enjoyed them all. I can honestly say that I’ve never left any kind of concert or gig wishing that I hadn’t bothered attending. And I’ve never, ever, been indifferent. Every single live gig or performance I’ve witnessed has made me feel something. In a world where, sadly, many of us seem to live under a permanent facade of blasé beige-ness, remaining resolutely unmoved and unexcited by everything, hearing that hubbub of excited chatter whilst filing out of a venue post-gig is something really special. To put it simply, music in any form has the ability to make people happy. It provokes opinion. It provokes discussion. It provokes emotion. And that’s no mean feat. Things you’re likely to say after leaving an Alt-J concert. Quote from ‘Blades Of Glory’ (2007). At the other end of the spectrum, attending a live gig given by some artists can actually make you appreciate their sound on CD/Vinyl/any non-live format more. Admittedly, this doesn’t happen to me with that much regularity. But when you’re listening to a band that you’re familiar with that doesn’t quite work live, their music just feels…off. A prime example of an instance of this is for me was seeing Alt-J at Leeds festival in 2015. Now, I love Alt-J. But I couldn’t help feel that the live format didn’t do their sound justice. As much as the lyrics are usually unintelligible, listened to through headphones, this indiscernible crooning sounds kind of cryptic and mysterious, soothing and alluring. Live, it just sounded to me like a kind of vaguely unimpressive mumble. Personally, I felt that their talent just didn’t translate to the live medium. This is probably a pretty unpopular opinion. I’ve had plenty of friends that have seen Alt-J live and loved them. I didn’t. I’ve got friends that hate Alt-J with a passion, branding them ‘Hipster Bulls**t, and with other, even less complementary titles.’ I don’t. I enjoy their output. Just not when I heard it live. As much as I am actually physically wincing at the reek of pretension that this statement unquestionably radiates; it’s the truth – I would much rather listen to ‘An Awesome Wave’ on Vinyl rather than hearing it mangled and distorted under the influence of dodgy acoustics and speakers that were simultaneously annoyingly tinny and an aggressive, ear-drum busting level of blaring. Perhaps you were present at that particular set and loved every second. My opinion might not be the same as yours. That’s fine. Such is the beautifully divisive nature of live music. You love it or you don’t. On this particular occasion, I didn’t. On the whole, though, I would argue that not much beats the live experience. The feel of the music vibrating through your whole body, shaking you to your very core, and that goosebumps initiating, hair-raising thrill of excitement the second the lights on stage are illuminated is pretty unique. So next time you’re at a gig, close your eyes, soak up the atmosphere, and cheer along with the best of them. Unironically and unapologetically add your voice to the cacophony of screams. Triumphantly and joyfully make yourself a part of the sound of the crowd. Enjoy the music and live life live.